Angry Birds Stella for PC: Stella isn't officially available for PC but you can download Angry Birds Stella game for Windows and Mac Computer using Bluestacks app player, Similar to previous Angry Birds games, The upcoming Angry Birds Stella is yet another physics based game from Rovio and it will be released for both Android and iOS. Unlike the recent Rovio games like Angry Birds Go, a kart racing style game and Angry Birds Epic, a RPG action game. Angry Birds Stella is a story based game with the traditional Slingshot style gameplay where the mighty Birds target the evil Pigs to destroy them. 1. You need a App player software called Bluestacks to install and use Android apps on your Windows PC and Mac. 2. Download Bluestacks from Here and after installing, open Bluestacks and search for "Angry Birds Stella" and install the game. If the game is not available then you download Angry Birds Stella APK file and open it using Bluestacks software. The game is set on a beautiful island called the "Golden Island" where a pretty bird named Stella along with here four friends Poppy, Dahlia, Luca and Willow wage a fierce battle on Gale, a foe turned friend of Stella and its evil Pig associates. Stella is officially available for Android, iOS, Amazon and Blackberry. 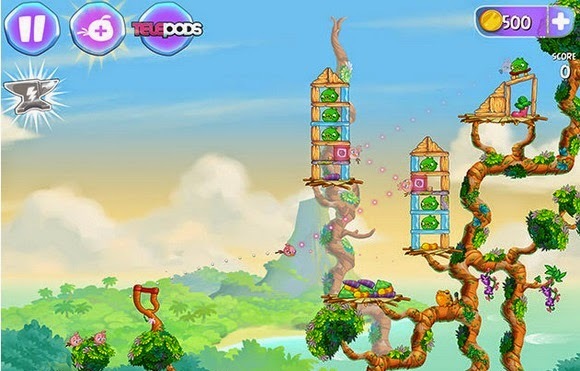 The game also features Telepods to play using physical toys and the immersive gameplay with unique power-ups make Angry Birds Stella a must play game on your smartphone and tablet. The game packs 129 levels each with a different with a different set of objectives to accomplish and you can earn coins for completing a level and also you can collect pics and custom outfits to use in the game. With the success, Rovio has launched Angry Birds Stella on ToonsTv and jolla too has come up with a stella themed launcher.